If you’ve come to this page, you are probably considering adding a sunroom to your outdoor living space. 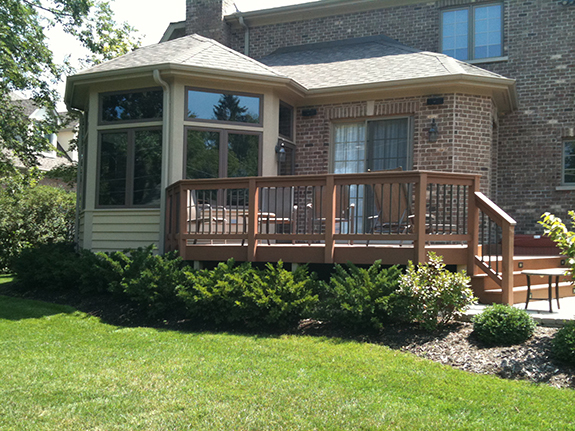 You can browse through our sunroom galleries to see the variety of sunrooms we’ve built in the Chicagoland area. 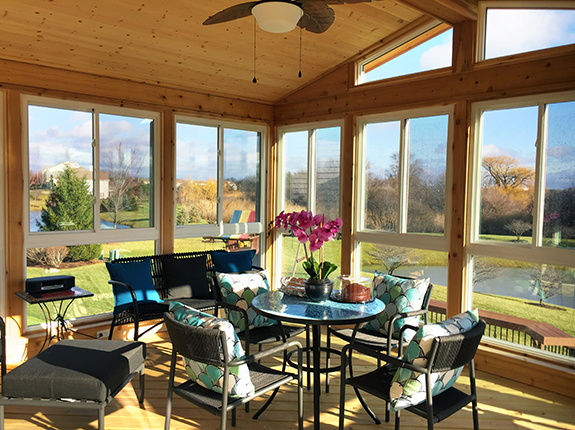 Sunrooms are built to protect homeowners from rain, wind, and snow while optimizing the amount of light that enters the room. You can even add special features, such as a fireplace, to add ambiance and warm up the room to enjoy on a chilly evening! 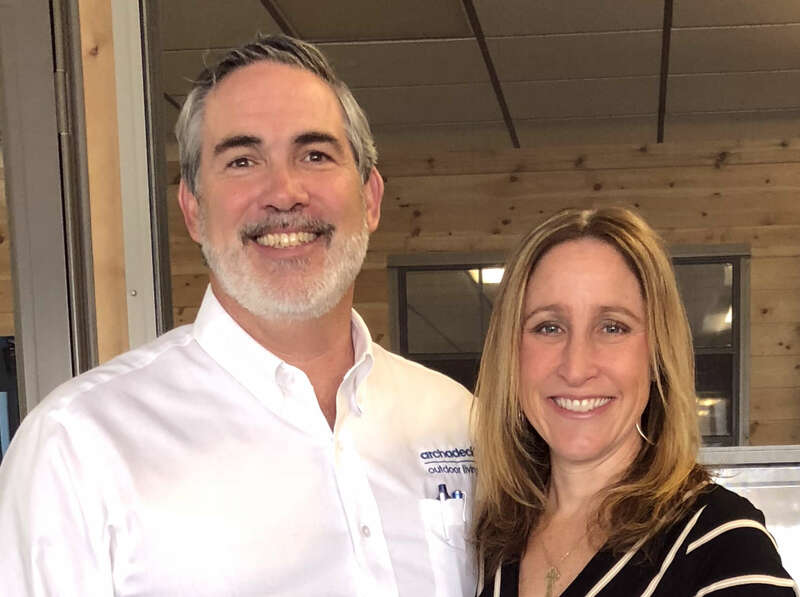 One of the most common requests we receive when area homeowners call for a sunroom is to have loads of windows and as much natural light as possible. Indeed, natural sunlight not only brightens your mood but doctors say it also provides the natural vitamin K that our bodies need. 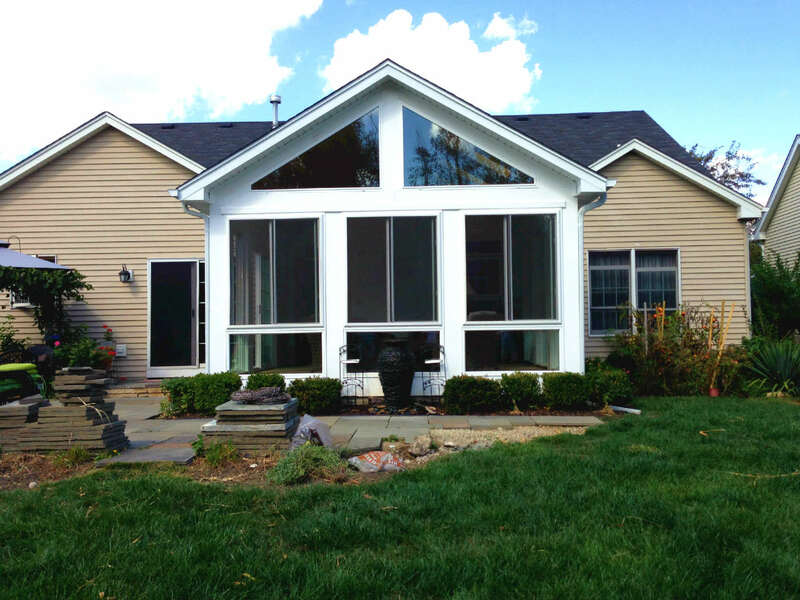 We can configure your sunroom to have any combination of windows you would like. There are many ways to get loads of sun into your room. Here are some key things to think about. 1) What direction does your backyard face? Depending on the orientation of your backyard, you may have more or less light during the time of day you most like to use your room. Are you planning on most enjoying your new space throughout the morning for reading, paying bills or doing some work on your laptop? 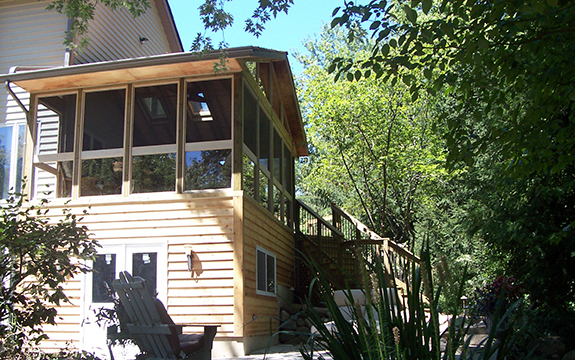 Or, do you plan on using your sunroom as a haven in the late afternoons? 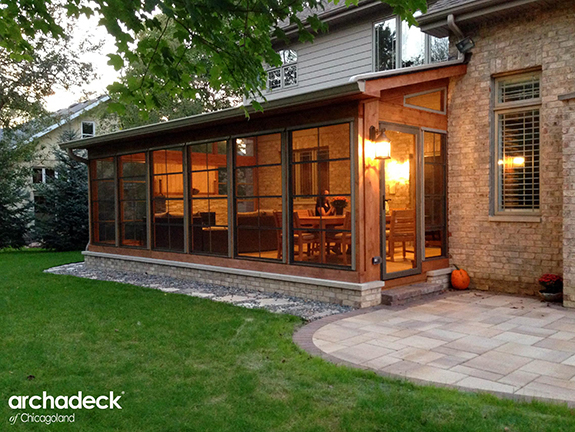 For either of these scenarios, knowing the orientation of your backyard plays a critical role. 2) How many trees are in your backyard? Regardless of the orientation of the back of your yard, if you have loads of trees, you may need your sunroom to have more opportunities to get natural sunlight such as through skylights. 3) What is the elevation of your primary living level? If your screened room will be attached to the second story of your home, the number of trees in your yard may not matter. 4) What type of roof do you plan to have? Often this is a question that needs to be answered while working with a trained and experienced builder. Most homeowners want a gable roof which creates a vaulted ceiling from the inside. Depending on the configuration of your second story windows, that may not be an option. Perhaps you have multiple hip rooflines on your home. It might make the most sense to have a hip roof. The shape of your roof will help determine what features we need to add to let in the most light. 5) Do you have any walls that you need to enclose for privacy or want to enclose for privacy? You may have an area of your yard that is unsightly or perhaps you would like more privacy from a nearby home. If one wall or a good portion of one wall will be enclosed, that is a critical factor. 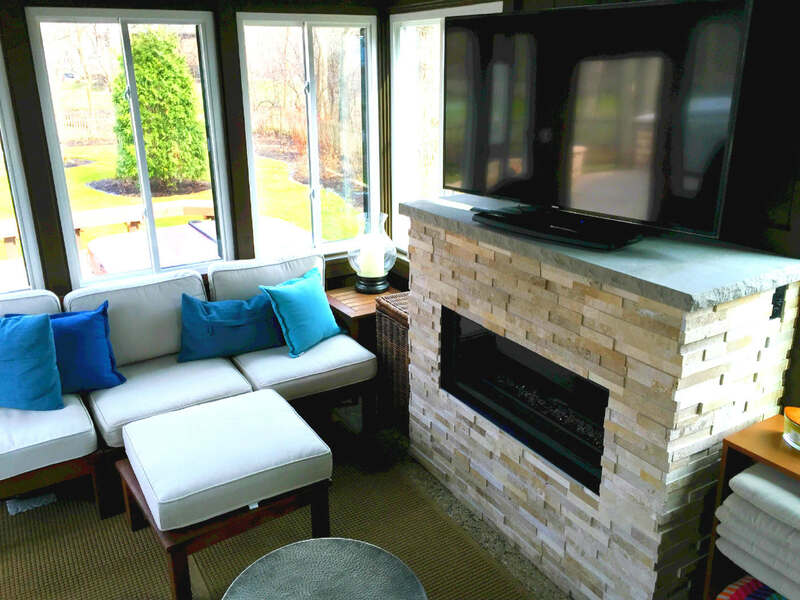 Here are some options for allowing loads of light into your new sunroom. An open gable end means that the elevated roof portion is finished with glass or another material allowing full visibility through that area. The porch above has an open gable end. Depending on the configuration of you room and what will work with the back of your home, you may be able to add transom windows as you see above. The important thing is to work with a qualified and very experienced builder. 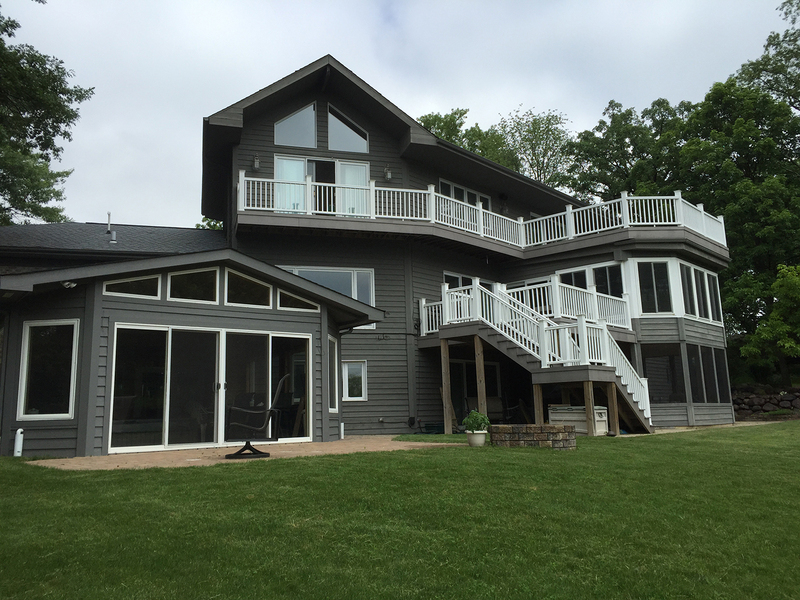 With any room addition to your Chicagoland home, there are local codes that must be met in addition to all the design configurations.